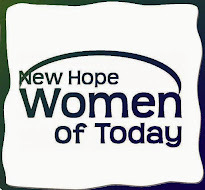 New Hope Women of Today: Leave No Trace - A message from our President. In scouts we learn to practice the concept of "Leave No Trace". We take extra care to ensure that we leave as little impact as possible so others can enjoy the unspoiled outdoors. But, we know that no matter how hard we try, we do leave a trace. A footprint, matted down grass or broken twigs. When camping, we concentrate on the "physical" traces we leave behind. But every day, we are leaving a trace of our passing. Everywhere you go, everyone you meet, and everything you do, leaves a trace. If you say something unkind, ignore someone when they are speaking, or snub them when they are trying to help, that can leave an ugly trace that can take a long time to heal. On the other hand, if you thank your friends, family and co-workers for what they do for you, offer assistance, and pay attention, you leave a good trace. You will interact with a stranger for a couple of seconds or with your friends for several hours, but no matter how long it is, you leave a trace of your passing. It's up to you weather you leave a trace that makes the world better or worse. So members: What trace are you going to leave this week? This month? How about right now? At home, at work, working on projects, at meetings?